When most people think of orthodontic braces, they picture someone who is a preteen or teenager sporting brackets and wires on their teeth. However, Dr. Gary Cartwright sometimes suggests braces for children even younger! Phase 1 (also known as early interceptive treatment) is a limited orthodontic approach that involves the use of growth appliances, expanders, or partial braces before the patient’s adult teeth have fully erupted. This care will typically happen when your child is between the ages of seven and eleven and tends to last 11-14 months long. 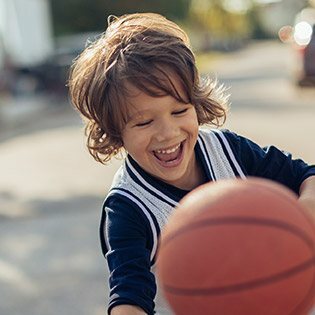 Here are answers to some of the questions you may have if your child has been recommended to wear braces at a young age. What is the goal of early orthodontic treatment? There are several goals that Dr. Cartwright might have in mind when recommending Phase I treatment. For instance, it may be important to further develop and adjust the child’s jaws in order to make room for permanent teeth to erupt successfully and to improve the relationship that exists between the lower jaw and upper jaw. In fact, this early approach can prevent serious oral health problems from occurring later in life, such as dental trauma or jaw surgery. 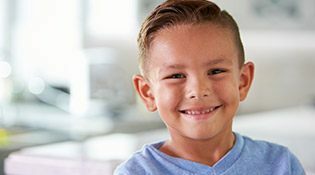 Our goal may also be to save young patients from experiencing crossbite, dangerous overcrowding, severe overbite and underbite, the too-early loss of “baby” teeth, and harmful oral habits. 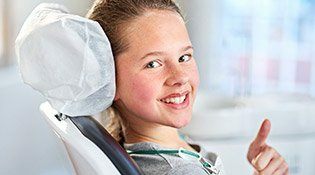 Simply put, we want to create a solid and receptive foundation for erupting permanent teeth, and this can be accomplished much more easily when your son or daughter is still relatively young. 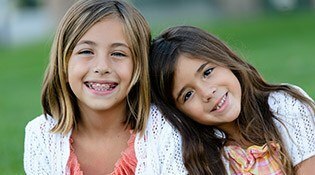 Why might a child need early orthodontic treatment? 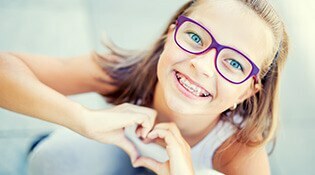 At what age should a child have an orthodontic screening? The American Association of Orthodontists recommends that children have their first screening by the time they are seven years old. For most kids, this is the time when all of their permanent front teeth and their first molars have come in. At this time, Dr. Cartwright can tell if there are problems with eruptions. 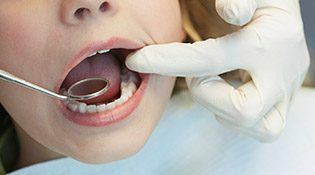 Also, he can evaluate your son or daughter’s jaw to detect growth discrepancies, such as a cross bite (when the upper teeth hit behind the lower teeth), crowding, or teeth that protrude. After this early evaluation, Dr. Cartwright will know if early treatment is necessary and when that should begin. What happens after Phase 1 Treatment? Your child will need to undergo a resting period. During this time, the remaining permanent teeth are given the time they need to erupt naturally into the smile. Dr. Cartwright will typically recommend the use of a retainer during this time; however, we may discontinue its use if it starts to interfere with this important process. What happens during Phase II Treatment? Once the patient’s smile is fully developed, it’s likely that they will be 11-13 years old and ready for Phase II. Phase II treatment requires a full set of braces and typically takes somewhere between 12-18 months of time to complete. The new, permanent teeth will be gradually shifted in order to improve your child’s oral function and aesthetics. Their new, confident smile will come together at last!